Oh, unfair question! I love everywhere I’ve visited, each a unique experience. However, the place I keep returning to is France. I love the culture, the food, the history, the language… all of it. I’m a quarter French, so maybe that’s why. But there’s something wonderful that awakens within me every time I visit France – and it has become one of my favorite destinations. Of course Paris is simply… Paris! It is its own definition. I can never get enough. 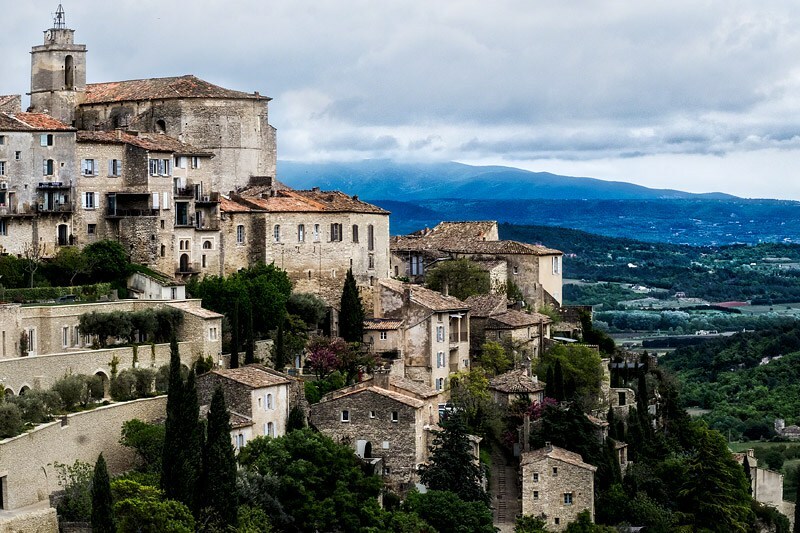 But I recently fell in love with the South of France… which is a completely different pace and experience. The little villages, the Mediterranean, the incredible weather, easy access to the Alps for breathtaking scenery… simply divine. I usually home base in Cannes when I’m there, which for me is perfectly located for any adventure I desire. While one can find amazing things any time of year – especially if you get out into the countryside – there are a couple times of year that are my favorites. Crowds give me a rash, so I’m all in favor of spring and fall visits. I avoid summertime at all costs… between the heat and the press of tourista humanity, I just don’t enjoy the experience as much. In the South of France (Provence and the French Riviera), even the locals leave town at the height of summer! Overall, France operates at a way different pace. They believe we should work to live, rather than live to work. So, in order to let inner race engine rev down and settle into this wonderful experience – a week is minimum. Three weeks is sublime. In a week, I’d only focus on a couple of areas… whereas with more time, you can enjoy city, country, seaside, mountains. It’s all there, beckoning. Be aware many places (esp. in the country, but even in many towns) close an hour or two for lunch and typically, nothing is open on Sundays. The bigger the city, the less this is true, but is something to keep in mind when planning your time and activities. Tip: Factor in downtime! Time to rest, relax, put the camera down, just BE. It’s so easy to try and pack WAY more into each day than you can actually take in. If there’s one thing you should get about France: it’s all about absorbing and enjoying life. Either Paris’ Charles De Gaulle airport (CDG) or Nice Côte d’Azur Airport (NCE) are great options. I love Nice airport; it’s smaller, easier to get in and out of and generally more manageable. Either are great options though, depending upon what activities you have planned. Both are international airports. Of course, Paris is not to be missed! If you go to the trouble to getting to France you owe it to yourself to visit for at least a few days and soak in the art, history and culture there. Strasbourg is another wonderful city, with a variety of photo opportunities. It’s also very easy to swing into Germany from there by train, so if you want to cover more than one country, you’re poised perfectly in Strasbourg. I love photographing Le Petite France at night – where you can watch the canal barges navigate through town, or even book your own luxury barge canal cruise. 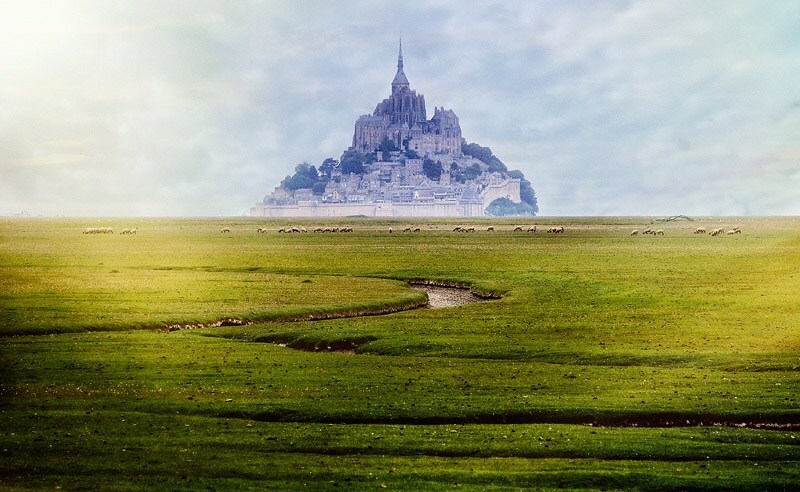 If you rent a car… the countryside of Normandy is incredible. 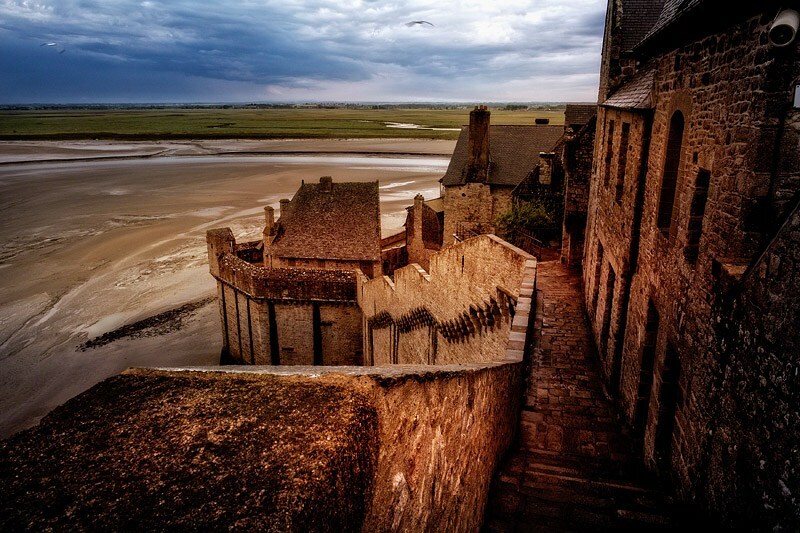 Don’t miss Mont St-Michel! 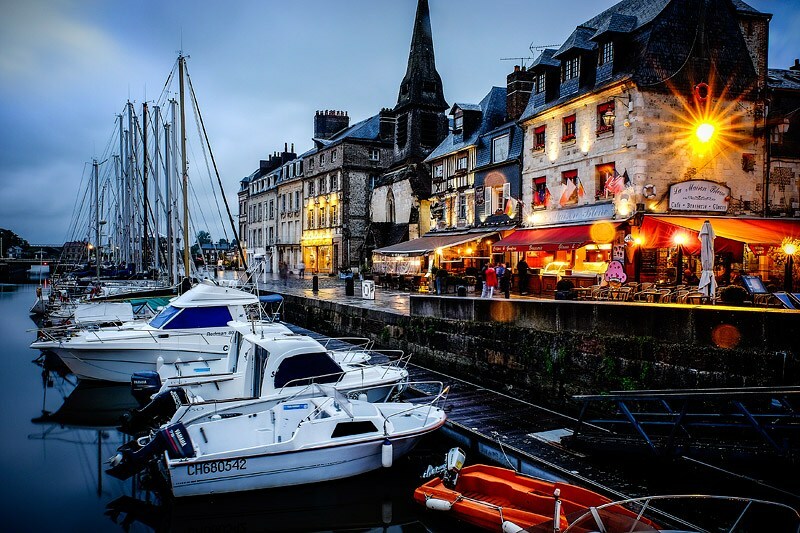 Tip: If you visit Mont St-Michel, plan an overnight stay on the island to enjoy photographing the place without the tourists and in the moody, beautiful lighting of nighttime! Then, when you’re ready a different pace of life and a visit to the Mediterranean side of life, the French Riviera is sublime. I like to home base in Cannes (home of the famous Cannes International Film Festival), where you can take day trips via the train system all up and down the coast to visit beautiful places like Monaco and Villefranche sur Mer, or hop on a bus and venture up to Grasse (the world’s perfume capital), or rent a car for a day and see ancient medieval villages like Vence and St. Paul de Vence. This part of France and far more affordable and accessible than many people think. Like so many parts of Europe, ancient cities, towns and villages weren’t built for cars and public transport. Even if you lodge in a town with plenty of transportation options, plan on LOTS of walking.Think in terms of tens of thousands of steps each day! Depending upon where you go, there can be stairs up hills, climbs up towers, or simply lots of ground to cover on foot. Even if you travel from one place to another via train, bus or auto, once you’re at your destination, you’ll want to explore on foot. Count on logging lots of miles/kilometers in the process! Then, if you’re a hiker, you might head out into one of France’s beautiful hiking areas. Love biking? Consider taking a bike tours of your favorite region! Cannes’ old town or Le Suquet was the original fisherman’s’ residential area of Cannes, parts of which date back 400 years. It overlooks the Bay of Cannes, with its eclectic combination of fishing boat and multi-million dollar yachts co-mingling in the same waters. In the foothills above Cannes is the the town of Grasse. It’s widely known as “a capitale mondiale des parfums” (translation: the world’s perfume capital.) Grasse has been known as the capital of the fragrance industry since the seventeenth century. In fact, they grow many of the flowers used in the perfumes created there in the fields surrounding the town. You can explore its richly scented history at the Musée International de la Parfumerie, or by talking to many of the local merchants. There are even places where you can make your own perfume! But Grasse is rich in culture too… and the colors, grungy textures and photo opps around every corner have captured my heart. I visit every chance I get. Tip: it’s gorgeous in the rain, especially at night! By all means, sink into the art, culture and culinary experience of France. There is SO much of that in Paris, of course; that’s a given. But when you venture out into the smaller villages scattered throughout France, you might discover wonderful art created by artistisans of all kinds. You’ll certainly savor the locally sourced and prepared foods of the region and of course, French wine is world-renowned. Part of French culture – especially outside of Paris – is a belief in savoring life; in taking time to enjoy it – and each other. The pace of living is slower, the moments richer as a result. It may take time to spool down, but it’s worth setting down the camera now and again and stepping into the slow lane. There, you can feel into the heartbeat of a culture that enjoys life, values art, loves delicious food and wine… and is passionate about most everything, including each other. My favorite discovery was learning how easy it is to get around in the French Riviera. It’s also less expensive to stay there than I expected; a wonderful surprise! It’s a region with SO much variety to offer, most of which is easily accessed by train or nice buses from a central location like Cannes. You can stay in one place, live like a local and really sink into the experience of exploring many gorgeous areas along the Mediterranean without ever renting a car. And if you DO want to rent one for a couple of days… within 90 minutes you can be in the Alps, in Provence and more authentic medieval villages than you can imagine! Tip: get an International Drivers’ License if you plan to drive… and familiarize yourself the with traffic laws, signs and what they mean. Embrace a slower pace, put your camera down once in awhile and enjoy the beauty and culture. Remember to take the time to savor each delicious morsel and sip while you’re in France! I offer a unique 5-day “Finding Your Artistic Voice” photography retreat in Cannes, right in the heart of the French Riviera. It’s part photo workshop, part personal retreat; created for photographers seeking to more deeply connect photographic technique with their most expressive artist’s voice. This small-group experience works from the inside out, combining daily photo walks in various locations, daily home-cooked meals that nurture mind, body and soul and 1:1 time with me. Karen Hutton is an International Landscape and Travel Photographer, Artist, Speaker, Author, Educator, and Voice. She has over 2 million followers on social media; with over 11 billion views of her photographic work. She is a Professional Fujifilm-X Photographer and has been featured in Talks at Google, Photo Plus Expo and on Stuck in Customs, TWiP, Macphun Software, Forbes.com, The Grid, and Rick Sammon’s DPE Podcast. Karen lives in the Sierra Nevada mountains of California. You can find her at Karenhutton.com. Words and images ©2017 Karen Hutton. All rights reserved.